En plein air. A French expression that means “in the open air.” A plein air painting is done outdoors. Last week, Jim, my painting instructor, took the class on a plein air field trip to Randall Apple Orchard in Standish. It was a warm, sunny fall day. Couldn’t be more perfect. And there were no bugs! We could paint anything we wanted. 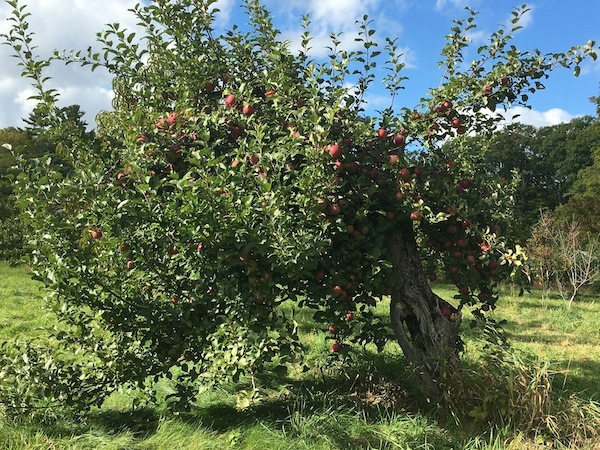 I chose a weathered old apple tree. In retrospect, I think I might have been better off to zero in on one section of the tree. Maybe a closeup view of one branch with a few dangling apples. Instead, I bit off a bit more than I could chew — so to speak! I’m not unhappy with the progress I made, but all those leaves and all those apples! They were overwhelming and I kept getting lost in them. I’ll post a picture at the end. A few days later, I had breakfast with an artist friend. Terrilynn Dubreuil. 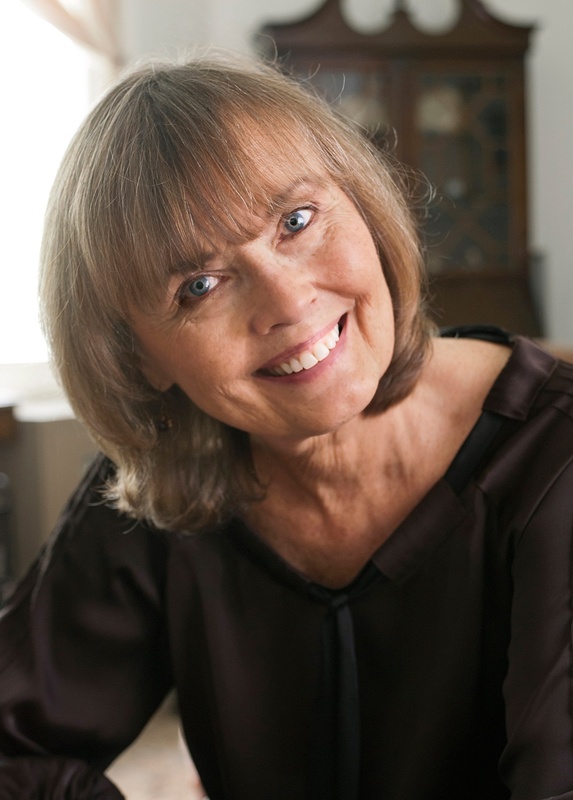 She’s a wonderful pastel artist, teacher and world traveler. Earlier this year, she spent three months traveling and painting in France, Italy and Spain. Check out her art and also, her traveling blog. I told Terrilynn about my struggles in the apple orchard. She asked if I’d seen Mondrian’s series of trees. No. But I’ve seen them now. 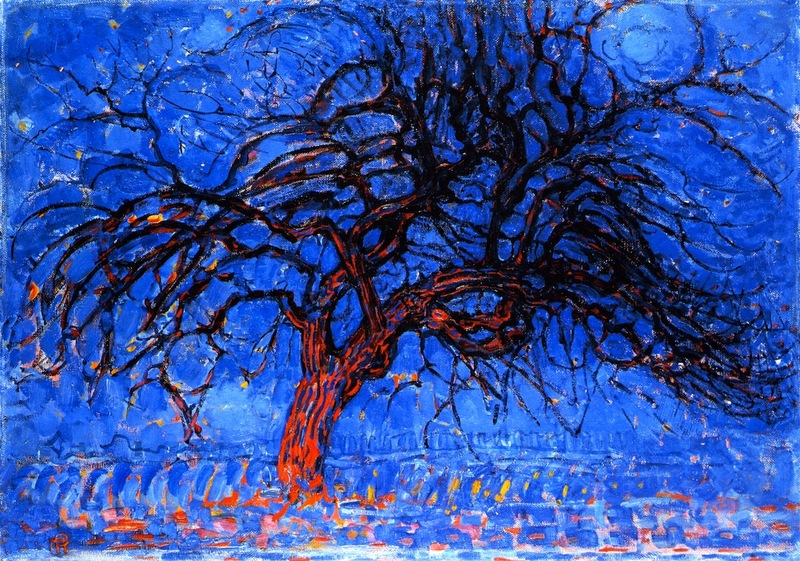 Piet Mondrian was born in 1872 in the Netherlands. His father and uncle were both artists and he followed in their footsteps. In 1892, he became a teacher at the Academy for Fine Art in Amsterdam. His own work at the time was considered representational. He was also interested in pointillism and fauvism. In 1908, he began a series of trees. The first is called The Red Tree. He narrowed his palette down to red, blue and yellow — the primary colors. It looks like a tree, but he used the colors in an unorthodox manner. 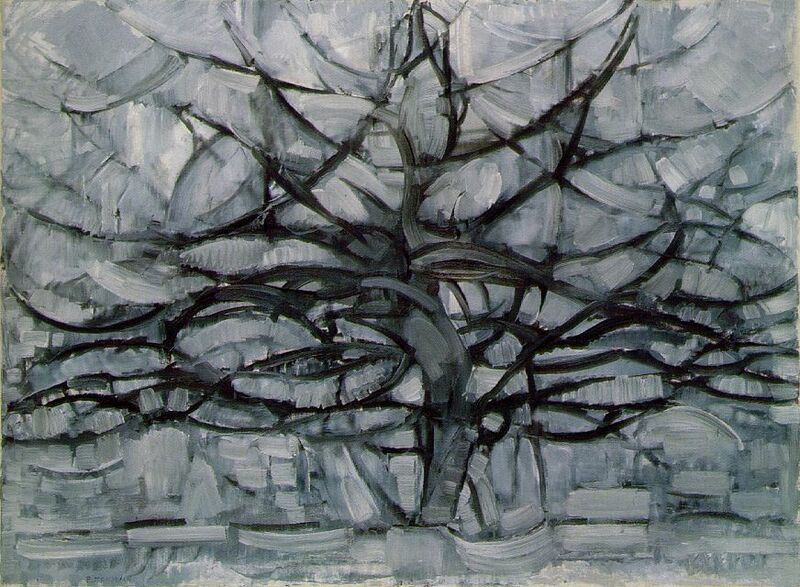 Within a few years, Mondrian’s paintings, overall and in the series of trees, became progressively more abstract. In 1912, he painted The Gray Tree. By then, he was interested in Cubism and had moved to Paris to develop his own abstract style. This time, he used a limited palette of grey and black and while you can still see a tree, its form has been reduced to lines and planes. Do you see the tree? He reduced it to its simplest elements. 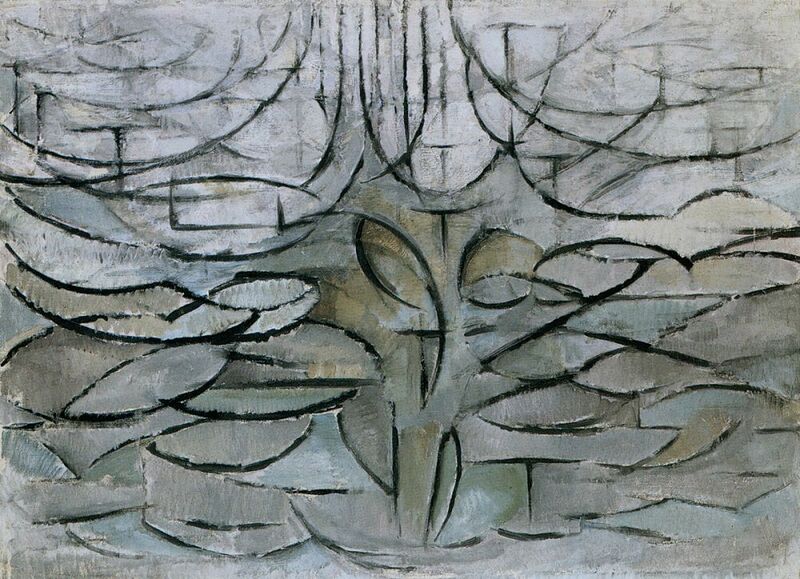 He used basic lines and shapes and muted colors to get to the essence of the apple tree as he saw it. Which tree do you prefer? This blog post has been more difficult to write than some of my others. I had to do a lot of research. I was aware of Mondrian and some of his later works. You might recognize the painting above, for instance. It’s the last one Mondrian painted before his death in 1942. I knew nothing of earlier work, his history, or his progression toward pure abstraction. I had no idea that he cofounded the Dutch modern movement known as De Stijl. Learning about him and seeing many examples of his art will help me with our next painting assignment. We have to paint something recognizable — person, landscape, cityscape, animal — but we have to use arbitrary or made up colors. “Be inventive with your color,” said Jim. What a great week. 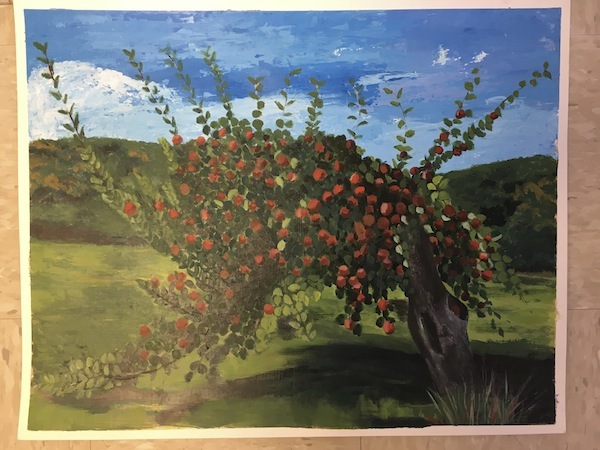 I got to sit in a sunny apple orchard for two and a half hours and paint. It doesn’t matter if I struggled with the apple tree. The only way I can explain it is that you get into a zone and nothing else matter. That’s what’s so wonderful about going back to school. It’s more than learning how to paint and draw (which I love doing!) It’s also about pushing my brain — let’s be honest, my aging brain — to take in and process new information. I felt a little intimidated by our assignment because I’m more comfortable with realism. 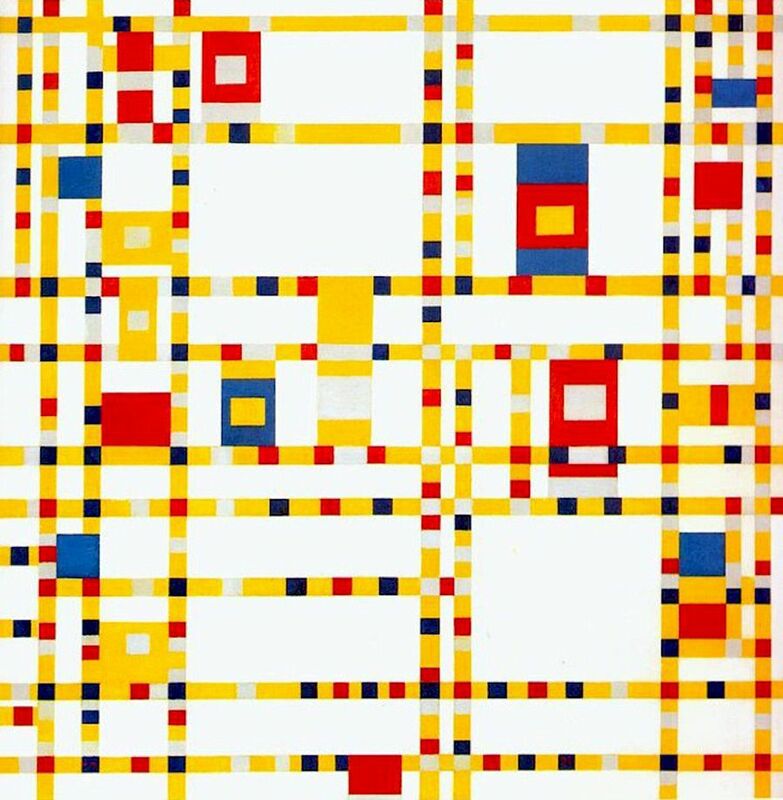 After spending an afternoon reading and writing about Mondrian, I’m inspired. Maybe I’ll try to do another apple tree! What colors should I use this time?